The first few series of Ashtanga Yoga are generally taught in a group class, although some men perform this practice on their own or under the guidance of a private teacher. As relatively few practitioners progress to the most difficult set of sequences, more advanced series are generally taught in individual sessions. It typically takes about 90 minutes to two hours to complete an Ashtanga Yoga practice series session. A session of Ashtanga Yoga typically begins with an opening prayer, followed by a vigorous round of Sun Salutation exercises. 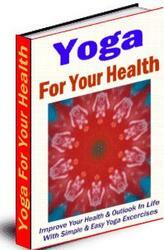 (See the opening sequence of "A Complete Yoga Practice Session for Men," page 114.) The Salutations, which are performed with jumping movements, consist of several variations followed by a whole series of asanas. These postures, which include standing, seated, and inverted poses, provide a complete workout for the entire body. During the practice of the Sun Salutation and the asanas, practitioners employ ujjayi breathing, apply the bandhas, and fix the gaze on one of nine prescribed points of vision. A session of Ashtanga Yoga routinely ends with a closing series that includes stretching and relaxation. Ashtanga Yoga is proving itself very popular with men because of its vigorous physical-ity. Many people who are physically active or who are trying to recover from physical injury are attracted to the practice because of its emphasis on strength and endurance. Ashtanga Yoga can help to align, detoxify, and calm the body. While Ashtanga Yoga emphasizes physical strength and stamina, a man need not necessarily be strong and fit to practice this style of yoga. Indeed, the practice of Ashtanga Yoga can help make you fit and strong. Ashtanga Yoga is a vigorous approach to the practice of yoga. It may not be suitable for all individuals—especially those with severe physical complaints or concerns. However, because the postures of the Ashtanga Yoga series can be modified to accommodate specific needs, you should be able to find a teacher who can help you benefit from Ashtanga Yoga. This style of yoga is specifically designed to help build strength and endurance and increase flexibility and range of motion. With appropriate instruction, Ashtanga Yoga may, in fact, appeal to some men who are trying to strengthen bodies weakened or compromised by illness or injury.